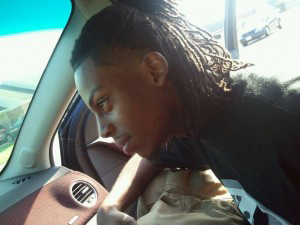 How Did 21-Year-Old Chavis Carter Get Shot In The Head While Handcuffed In A Police Car? Chavis Carter, dead in Arkansas: shot himself in the temple, with his hands tied behind his back. In Arkansas. The deep south. Now what do YOU think? Police in Jonesboro, Arkansas have launched an investigation into how 21-year-old Chavis Carter was shot in the back of a patrol car Saturday night.Carter, who died at the hospital, was in the passenger seat of a pickup truck that was pulled over by police just before 10 pm, reports WREG. According to Officer Keith Baggett who was on the scene, Officer Ron Marsh found “some marijuana” and several new plastic baggies when he searched Carter. When they ran his information through dispatch, they found that he was wanted on a warrant in Mississippi, where he lived. The cops then handcuffed him, searched him again, and put him in the back of the patrol car. While Baggett searched the vehicle, he claims he heard “a loud thump with a metallic sound” on his trunk and saw Ron Marsh motion to him. The thumping noise, according to the cops, was Carter shooting himself in the head. The police report attributed the death to a self-inflicted gunshot, though when the two officers opened the squad car door, they found Carter’s hands were still cuffed behind his back. The gun, they said, was somehow missed in both searches. “Any given officer has missed something on a search, be it drugs, knife, razor blades, this instance it happened to be a gun,” Jonesboro Police Sergeant Lyle Waterworth said after the bizarre incident. The police believe that Chavez managed to pull out a hidden gun and shot himself in spite of the handcuffs. According to Teresa, Carter called his girlfriend while he was pulled over to tell her he’d call her from jail. She also said her son was shot in his right temple, when he was left-handed. The two officers involved are now on administrative leave until the investigation concludes. WARNING: Research shows that carrying a small amount of marijuana in Arkansas can make you commit suicide in the back of police cars. If you’re, you know, a n*****, that is.